In 2008, the State Arts developed a traveling exhibit that celebrated some of the music and craft traditions that make up New Hampshire’s living heritage. The exhibit was based upon activities in the Learning Center of the New Hampshire Folklife website called Heritage Arts Build-A-Pictures. These activities introduce a range of traditional art forms as illustrated by New Hampshire artists. Each artwork focuses on a different aspect of a tradition, such as processes, forms, or tools unique to each tradition. The activity introduces words that have unique meanings within each tradition and that are basic to understanding them, helping to expand the concept of literacy. For the exhibit, eight of the original art works were reproduced with accompanying text panels to help viewers learn the words used in those traditions. Traditional art forms featured in the exhibit include: ash basket making; sheep sheering & spinning; stone wall building; blacksmithing; fly tying; dog sled making; contra dance & music; and French Canadian music. Discovering Heritage Arts in New Hampshire toured to nine public libraries and one historical society from June through October of 2008. To accommodate the facilities of various libraries, two versions of the exhibit were developed--one made up of portable display panels and the other version designed to hang on existing walls. Click here to view the introductory panel for the exhibit. Click here for photos for 2008 exhibit installations. The activities have been designed for young people 3rd grade and up. Each picture can be assembled as a virtual jigsaw puzzle. In the process of putting together the puzzle, young people can read about the tradition, do some fun research, and write a related poem. 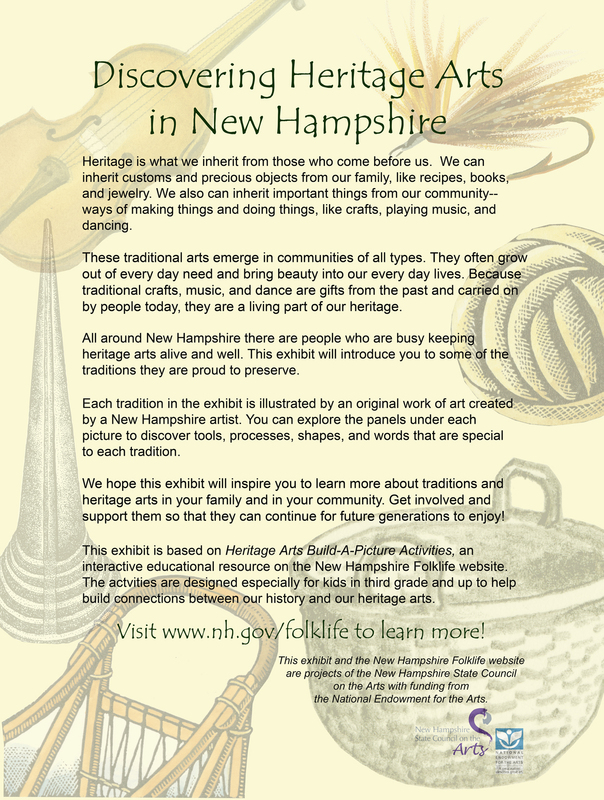 Heritage Arts Build-A-Picture activities, as well as other sections of the New Hampshire folklife website, can be especially helpful to teachers of all grade levels who are covering units on New Hampshire history.